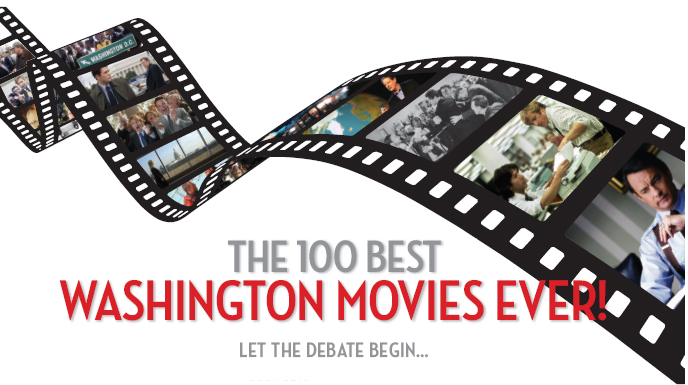 I groan when I hear about yet another “Washington” movie because few of them reflect the way we Washingtonians really live. For instance, in No Way Out, some bad guys chase Kevin Costner – so he jumps over the K Street expressway and runs down the entrance of a (non-existent) Georgetown Metro stop, where he boards the Baltimore subway. By the way, that subway is subbing for our Metro, which – wisely – won’t allow scenes with weapons or chases. But there’s more. How many Washington movies have you seen where somebody drives from Bethesda to downtown by way of Arlington Cemetery with a swing by the Jefferson Memorial? Or makes it from the Lincoln Memorial to Capitol Hill in five minutes during rush hour? Too many. Oh, I’ve got my list of winners and losers. I hated Arlington Road because weirdo Tim Robbins blows up the FBI Building. That’s crossing the line in my book. I loved the original Manchurian Candidate – the one where they brainwash Laurence Harvey – because they included a television press conference with gigantic 1962 cameras from WRC-TV. I have a very fond spot in my heart for Earth Versus the Flying Saucers, which I saw at the Big Chief Drive-In in San Antonio with my dad. Even though the flying saucers slice through the Washington monument, I forgive them, because as a kid, that movie thrilled me – and I never dreamed I’d actually live here. Speaking of thrills, I still try to walk up and down the Exorcist steps on M Street every few years in tribute. One of my favorite Washington films is Being There, in which Peter Sellers plays an idiot gardener who only knows the world through television. Thrown into the real world, our town’s most powerful people take his utterances as pure wisdom. Being There also has great scenes of D.C. in the late ’70s, and I think it’s the first movie to use Biltmore in Ashville, North Carolina as a location. Rent the movie if you haven’t seen it, and then go see Biltmore. I also love Broadcast News, which holds up pretty well. James L. Brooks spent several days at NBC before he shot it. He includes a hilarious scene of a news aide running with a tape to the control room. She jumps over people, knocks things over, and makes it in the nick of time. Brooks put this in because back then, Channel 4 edited videotapes in the basement and played them back in master control on the other side of the building. Somebody made that hall run every night – it was part of the rush of working in TV. Now, I work at WJLA ABC7, where they have state-ofthe- art equipment. The editors put our tape into a computer, hit enter, and it’s done. Still, I’m glad I worked in TV in the hall runner days, and I’m glad Broadcast News immortalized them. Nine-time Emmy-award-winning film critic Arch Campbell reports on theater and entertainment for WJLA ABC7 and 97.1 WASH-FM.